Is Your Hairstyle Blunder Giving You an Aged Look? As long as you are in your twenties or early thirties, deep or dark shades will suit you. Thereafter, go a little lighter as your skin starts to lose pigments. Otherwise, there will be a huge difference between the shades of your skin and your hair and it will look awkward. Going blonde is certainly a good trick to hide your gray strands. But picking too light shades or going completely white may make you look shockingly older, especially if you have dark or brown hair for your entire life. Hence, make sure that you are opting for the blonde the right way. Choosing a color that is at least one or two shades lighter than the base color of your locks can help you look much younger. You can also go for subtle or strong highlights in spite of a full-head coverage. These will add softness to the shade and flatter your look. 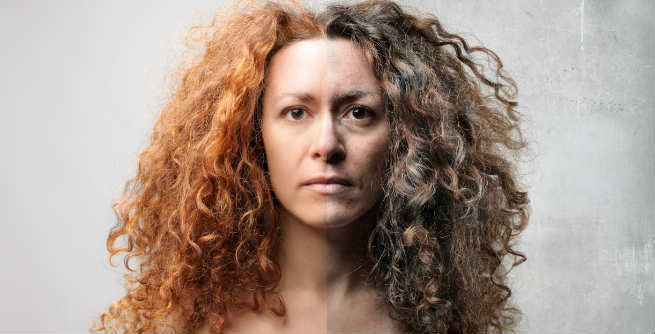 Our hair loses its natural moisture along with its pigment as we age. Consequently, it becomes damage-prone and less shiny. It is of utmost importance that you moisturize your dry, dull strands regularly in order to give them an anti-aging effect. Practice weekly deep conditioning, leave-in conditioning, application of serum, etc. for this purpose. Adding random layers to your haircut can help you turn back the time efficiently. Try to give the bottom half of your hair a light bubbly look and feel. All you need to do is blow-dry the hair upside down in order to maintain the hairstyle properly. No matter how straight your hair is, you must add body to it as you age. Over-application of serum, wax, straightening cream, etc, can give your hair a sleek look. But at the same time, it can also age you. Hence, try to add volume and shine to your hair so that it becomes bouncy and gorgeous. Still stuck to your favorite hair cut, style or color that has become year-old now? You are doing it wrong. The trendier your hairstyle is, the younger you look. So, change your look yearly by modifying the trends as per your age. Just have a look at the classic cuts. Don’t you find them updated bit by bit every year? Make your all-one-length locks look flattering by adding choppy layers, side-swept bangs or fringes to them. Start covering your gray hairs as early as possible. Always part your hair to one side and complement the look with a long bang. It will help you brighten your cheekbones and make you look younger.